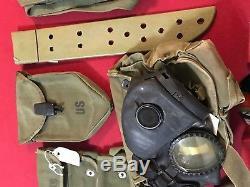 For sale is one lot of Vietnam era Field gear. 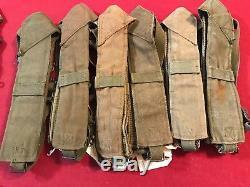 6 sets of M1956 suspenders, size Regular. 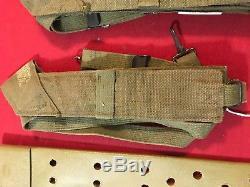 1 set M1956 suspender Size Long. 1 ERDL camo boonie hat, new unopened in original package, 1969 dated, size 6-5/8. 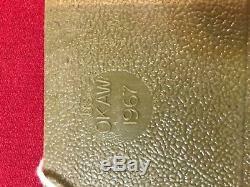 1 Machete scabbard, new, no hardware, US Okaw, 1967 dated. 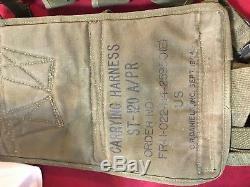 1 Nylon entrenching tool carrier, new, 1969 dated. 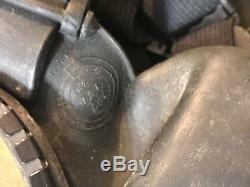 1 gas mask, 1962 dated with canvas bag. 1 ST120 Radio carrier for PRC 8,9,10 radios, 1964 dated. 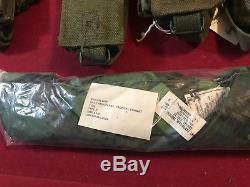 1 3 pocket grenade carrier pouch, new, 1967 dated. All items used unless noted. 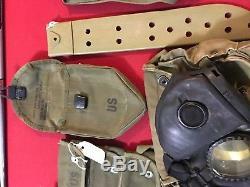 The item "Vietnam Era Field Gear Lot Original" is in sale since Saturday, July 28, 2018. This item is in the category "Collectibles\Militaria\Vietnam (1961-75)\Original Period Items\Personal, Field Gear". The seller is "rosims" and is located in Monroe, Louisiana. This item can be shipped to United States.